It’s my husbands birthday today but he doesn’t want me to bake him a cake, or throw a party or make a fuss. It’s funny how for some of us getting older is a thing to celebrate, a day to spend with friends or family and over-indulge but for others it reminds us of what we have yet to achieve and how fast time passes. I honestly like getting older. Looking back I can see how much things have changed and how far I’ve come, and make plans for where I want to be going. 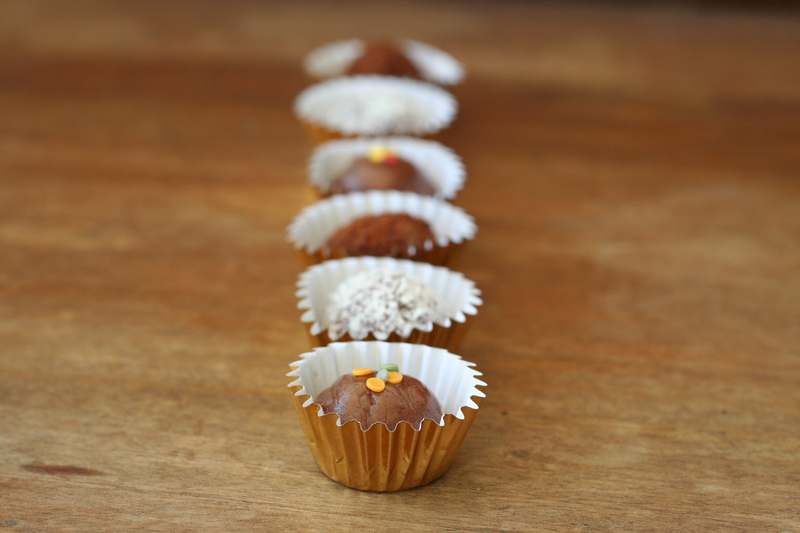 However you look at it, to me birthdays still need some celebration, and what better way than with brigadeiros? 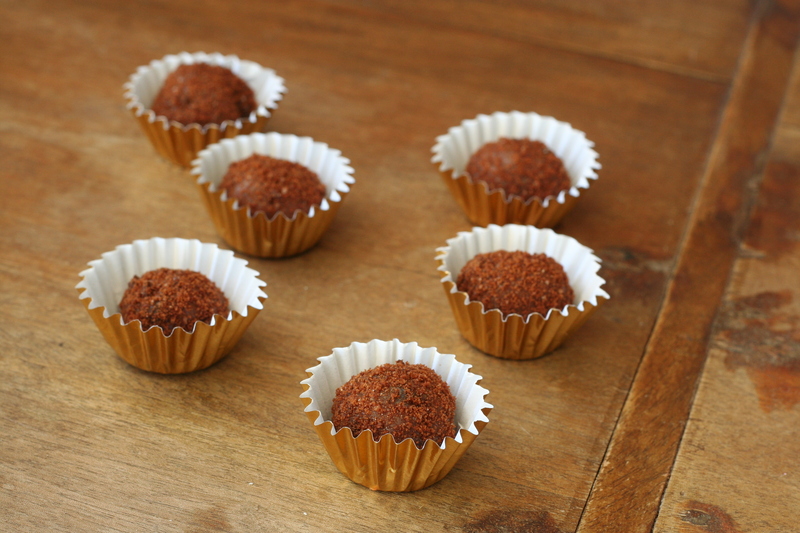 Brigadeiros are basically Brazilian truffles. 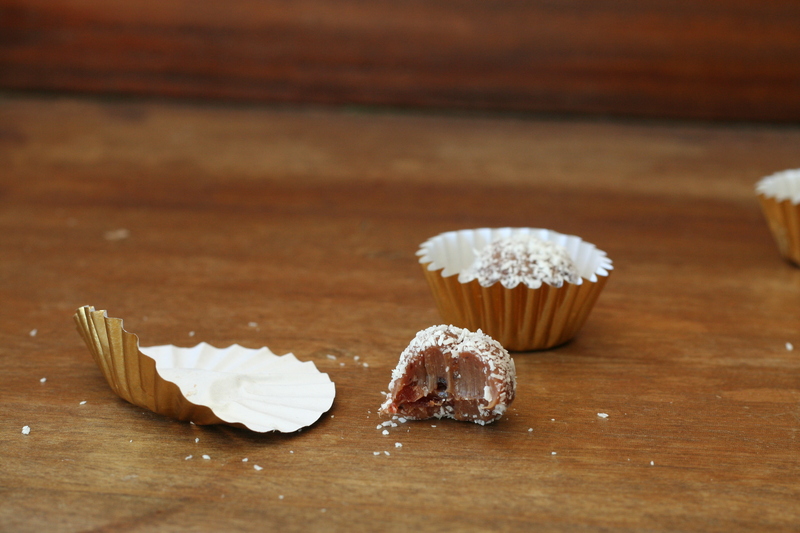 They’re so simple to make with only three main ingredients, but taste unbelievable. Rich caramel flavour with a chewy and dense texture, the versatility of these little treats is only limited by your imagination. 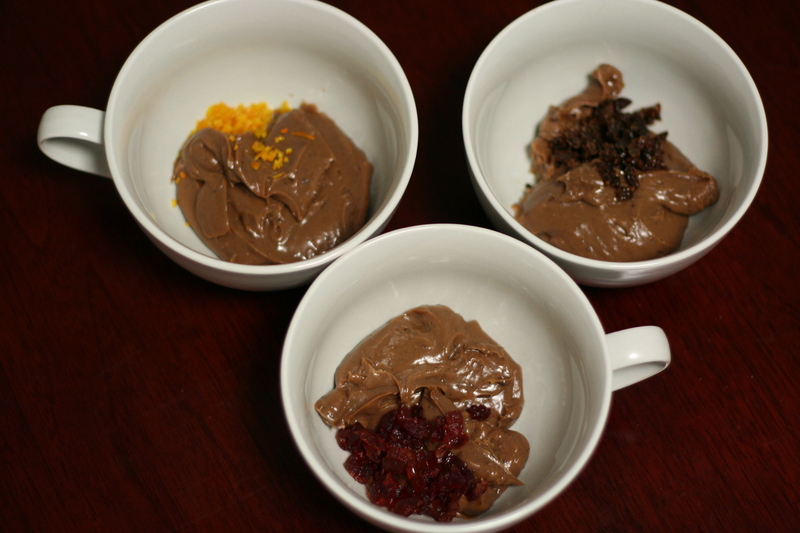 Traditionally coated in chocolate sprinkles, I like to flavour mine with whatever I have on hand. This time I chose to make three varieties: orange, cherry and coconut and rum and raisin but almost any combination will work well. Be careful if using liquids to flavour your mix as too much will change the consistency and make them hard to roll. Using liquors or flavoured essence should allow you to get a decent amount of flavour without too much liquid. Do be careful to stir the mixture constantly as it will burn quickly. Place all ingredients in a medium saucepan over a medium heat. Heat the mixture stirring constantly for 10-15 minutes or until the mixture gets thick and sticks together. You will find if you tilt the pan the mix will slide together rather than sticking to the saucepan. Divide into separate bowls depending on how many flavours you are making and allow to cool. 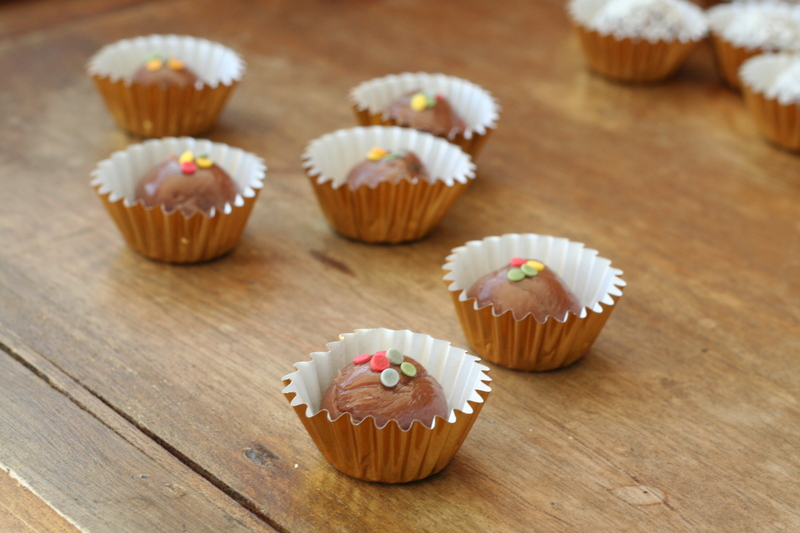 You may find it easier to add your flavouring before cooling but don’t try to roll the brigadeiros until the batter reaches room temperature or they will be very messy! Soak the raisins in the alcohol for 5 minutes then add to the mixture. Process the chocolate biscuits to get a fine crumb then roll each ball in the crumbs. Hi! This makes about 3 dozen truffles depending on what size you make them, mine were about 2cm each. The recipe is really easy to double too. They go really well in gift bags, but just as a warning, if you don’t roll them in something they tend to stick to everything! Got me at condensed milk! Sounds lovely. Oh yes, birthday wishes to your husband! wow, these look simple but addictive. Thanks for sharing! Yes they are addictive. 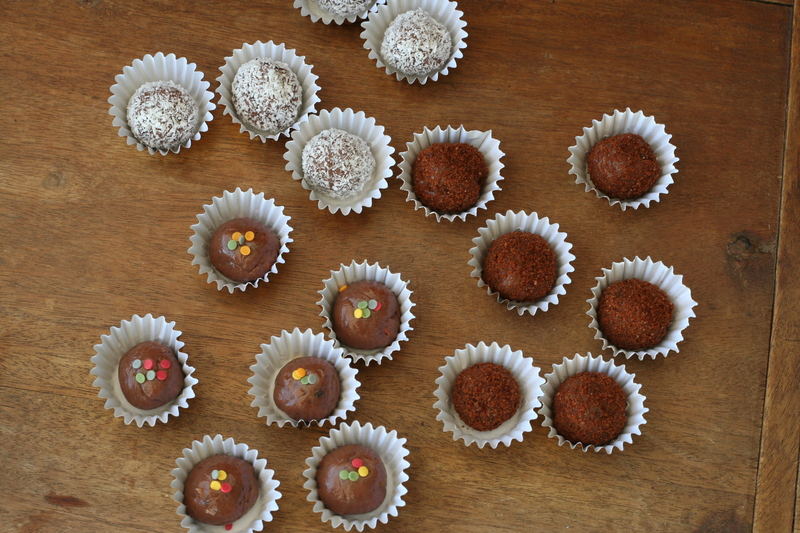 If you want to try some amazing brigadeiros, check this company out: http://www.brigadeiropalace.com. They have over 30 flavors! Amazing! These look so yummy. I really want to try them out soon. If I get any good photos I’ll try sharing them with you on your facebook page. Thanks for introducing me to Brigadeiros. Your truffles sound delicious! Looking forward to trying them. Very nice! I tried making these a while back without luck. Maybe I’ll try your recipe 🙂 Thanks! i’ve never heard of these before but they look yummy. i love your flavor combinations.